I once spent an afternoon in a great temple complex outside Kathmandu, where I was staying with a favourite aunt and uncle who had taken their retirement amongst the ancient palaces of Patan. 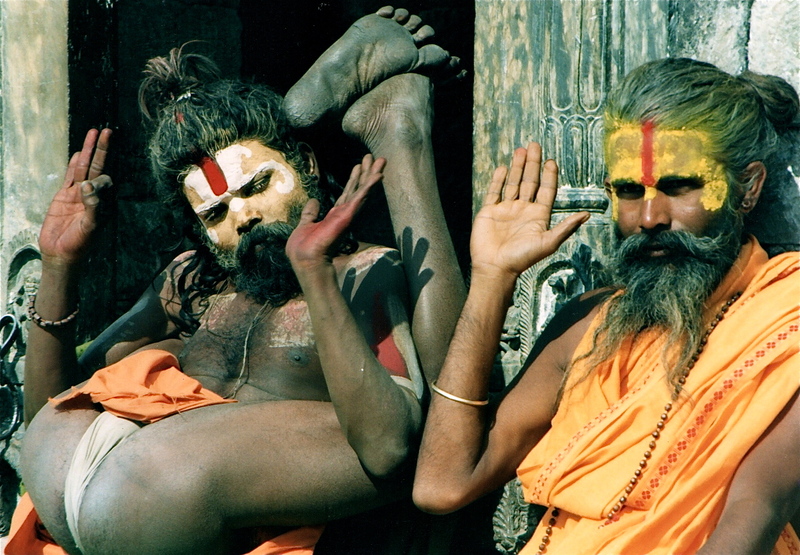 My excursion to the gilded pinnacles and bell-strung pagodas of Pashupatinath commenced at dawn, where, on a hill above the press of pilgrims, the bleat of touts and tourists, I first set eyes upon a group of naked Nath-babas. So extraordinary was their appearance that I let decorum slip and stared. In response, they cheerfully beckoned for me to join them in their silent, smiling survey of the madding melee down below. And thus I sat, relishing my own dismay, amidst air thick with incense, mantras, funerary soot and the percussive pop of skulls, beside new companions with unkempt hair, bendy legs and skin dusted with cremation ash. New companions with horn whistles, brass rings and white pebbles strung on hair cords to show they had once made a pilgrimage to offer coconuts to the Chandra Gup mud volcanoes. I shared with them my picnic breakfast of puri aloo dum and sweet bananas. In return, they explained that theirs was a path dedicated to freedom from social restraint, the rejection of a merely secular identity. They told me they employed Shiva in his ‘fierce’ form of Bhairava as their focus for meditation and devotion. That Siddhartha Gautama, the Supreme Buddha, had been an initiate of their tradition. That their teachers communicate with every form of life, whether banyan tree or pepper-vine, elephant or mongoose. And that when they died, their corpses were not cremated, but buried sitting in a yogic posture, their graves marked only by a solitary linga – phallic symbol of consciousness devoid of limitations. The Nath-baba sect was founded a thousand years ago by Gorakhnath, a principal proponent of the physical yoga practises we know today – a man remembered for being so beautiful that he could sneak into the royal zenana, or harem, and mingle with the courtesans unnoticed. Still today Gorakhnath is venerated in the burning of fire-pits along the Himalayan foothills, whilst the entire Gurkha tribe of Nepal claim direct descent from him. However, he best remembered for not only writing the very first text on the practice of Hatha Yoga, but is attributed with being the very first author of any prose in Hindi. This entry was posted in Uncategorized and tagged Himalayas, India, mountains, Nepal, sadhus, tantra, temples, yoga. Bookmark the permalink.